Chapman Garden started life as a street with houses but this was destroyed during World War II. More recently it has been a growing garden, but unfortunately this has become neglected and whilst it was then picked up again by a variety of organisations and many have enjoyed circumstances have prevailed that she has been neglected again. So over the summer we have been putting together another attempt to make her more sustainable. Whilst clearing the garden with a group of volunteers we noticed that a lot of the plants were beautiful, natural occurrences. 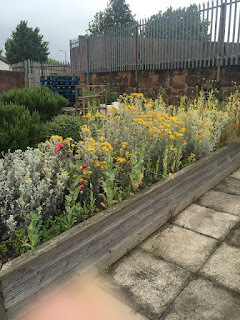 We spotted 4 different types of grasses, 6 species of butterflies and 2 species of bees and we thought what a lovely natural wild flower garden it could be. We are now researching all the things needed to sustain and nurture the garden over time as well as promoting and protecting our wildlife.